About six weeks ago, I wrote about buying a Dell laptop loaded with Windows Vista, and the way that decision allowed the gaping maw of despair to open up beneath me.... Mercifully I know how to wield a roll of packing tape and a Sharpee marker, and before long the laptop and all the peripherals were in boxes and back on their way from whence they came, and ere a little longer, the nightmare ended. That's right: I've been to Dell and back. The good thing about that experience was that it gave me a better sense of what I really wanted and what I really didn't want. I waited until the charges were removed from my credit card, and then I bought a Lenovo, aka an IBM ThinkPad. And I love it! I just love it! Not only is it a better computer, but it also cost $250 less than the previous monstrosity, because it didn't come loaded with a bunch of software I didn't need. Of course, it also didn't come with some software I did need, but one nice thing about working for a university is that they have licenses out the wazoo for just about every type of software you might use, plus a computer store where you can buy discounted versions of the few things they don't license already. 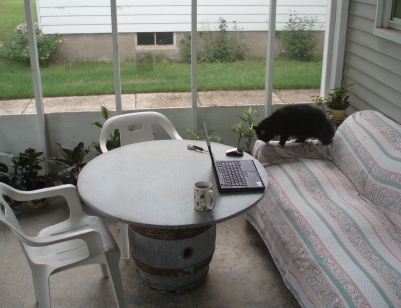 That's right: I'm outside, on my porch, on my couch, hanging out with my cat (and optical mouse! har! har!) and it's cool and quiet and lovely and I have a mug of tea AND THIS IS HOW I WORK, and life is really freakin' good. I even have an electrical outlet behind the couch, so I can work out here all day. Yeah. Life is really good. I (am a dork) totally laughed at your mouse joke and at "to Dell and back." That looks like a much better place to work - laptops are AWESOME! Which OS did you end up with? Windows XP? Turning positively green over here. Now you can take it to someplace inspiring and write write write. Oh you lucky thing. Hi Rebecca--glad someone besides me laughs at my really lame jokes. MHH--yes, I did manage to get XP, though I had to pay 30 bucks extra or so for it. Juti, I know I am lucky to have finally joined the 21st century. I'm just glad I somehow decided to do it. I also laughed at the "dell and back" and "optical mouse" lines. Very clever (not that I would expect any less). Looks like a great computer. Awesome new workstation !! I also am getting a little green. I have also been balancing my options with respect to acquiring a new laptop. I'm thinking of getting one used since as you said in your previous post, they are often still perfectly viable computers. 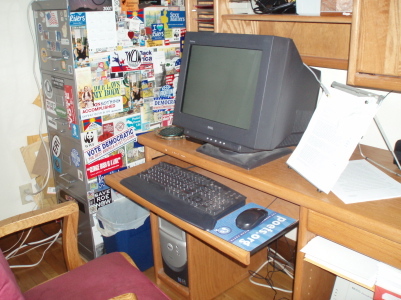 The one I have now, I have had for 8 years, has only Windows 98, Office 98 and Internet Explorer 6. Since work is now using XP, and therefore newer versions of Office and Internet Explorer, I was thinking of updating so that I could keep everything uniform but your previous excursion through "dell" left me slightly wary (since I don't have an IT guy who will make my new laptop happy). I did however recently install DSL modems on my computer and the one that my brother and I set up for our parents to use, so I'm in that "welcome to the 1990's" frame of mind. Anyway, happy computing and have fun (it certainly looks and sounds like you will). This page contains a single entry by Holly published on July 25, 2007 9:02 AM. I Bet It Even Tastes Better was the previous entry in this blog. For Whom the Cat Bell Tolls is the next entry in this blog.